SACRAMENTO, CA--(Marketwired - Mar 18, 2015) - Propel Fuels (propelfuels.com) has launched California's most advanced diesel fuel: Diesel HPR (High Performance Renewable) at Propel locations across Northern California. Propel's Diesel HPR uses Neste Oil's (nesteoil.com) NEXBTL renewable diesel, a low-carbon renewable fuel that meets petroleum diesel specifications for use in diesel engines while realizing the benefits of better performance and lower emissions. 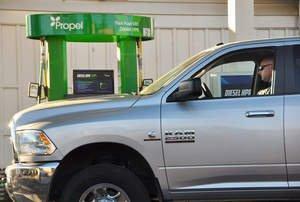 Diesel HPR will be available at 18 Propel locations in Sacramento, San Jose, East Bay, Redwood City and Fresno. Locations, directions and real time pricing can be found on Propel's mobile app available in the Android and Apple app stores. A complete list of locations is also available at dieselhpr.com/locations. "Diesel HPR exceeds conventional diesel in power, performance and value," said Rob Elam, CEO and Co-Founder of Propel. "Propel is committed to offering Californians the most advanced low carbon fuels that meet our high standards for quality and value." Incorporating diesel refined from renewable biomass through Neste Oil's advanced hydrotreating technology called NEXBTL, Diesel HPR meets the toughest specifications required by automotive and engine manufacturers, enabling the fuel to be used by any diesel vehicle. Diesel HPR is designated as ASTM D-975, the standard for all ultra-low sulfur diesel fuel in the U.S., and is recognized as "CARB diesel" by the California Air Resources Board. Diesel HPR provides increased engine power and torque, as well as significant reduction in harmful tailpipe emissions, NOx emissions and particulates (PM). "This renewable diesel joins a growing suite of new, cleaner transportation fuels in California thanks to our Low Carbon Fuel Standard and forward thinking companies like Propel," said California Air Resources Board Chairman Mary D. Nichols. "We are pleased to see the introduction of a low carbon fuel at California retail fueling stations," said Tim Olson, Energy Resources Manager for the California Energy Commission. "Our state needs several options to reduce greenhouse gas emissions in the transportation sector and this cooperation between Propel Fuels and Neste Oil provides a tremendous opportunity to de-carbonize diesel fuel and help achieve our climate change goals." According to the U.S. Department of Energy's Alternative Fuels Data Center, renewable diesel's high combustion quality results in similar or better vehicle performance compared to conventional diesel, while California Air Resources Board studies show that renewable diesel can reach up to 70 percent greenhouse gas reduction compared to petroleum diesel. "As California continues to lead the world in clean fuels, we need to insure that the benefits are shared by everyone. Renewable diesel provides significant immediate reductions in emissions that damage our health and change our climate, providing lasting health benefits for the disadvantaged communities that currently suffer the most from petroleum diesel pollution," says Bill Magavern Policy Director for the Coalition for Clean Air. "We congratulate Propel Fuels on their initiative to introduce Diesel HPR to consumers in California and are excited to be their supplier of choice with our NEXBTL renewable diesel," said Kaisa Hietala, Neste Oil's Executive Vice President of Renewable Products Business Area. "NEXBTL renewable diesel reduces emissions as well as enhances engine performance leading to lower maintenance and service costs. It also has excellent low-temperature properties which result in better vehicle reliability during the winter," continues Hietala. Neste Oil Corporation is a refining and marketing company specializing in high-quality fuels for cleaner traffic. The company produces all of the most important oil products and is the world's leading supplier of diesels made of renewable raw materials. In 2014, the company's net sales stood at EUR 15 billion, and it employs some 5,000 people. Neste Oil shares are listed on the NASDAQ Helsinki. Editors Note: More information and photography for download and use is available at dieselhpr.com/media.